The Anaconda is now available directly from TOPS Knives. This big chopper is the same one you saw in the Woodsmaster Jungle Survival video. This baby has "Been there and done that"
The New "B" model Anaconda 7"
This new Anaconda has a redesigned grip for exceptional control, a sweeping point that incorporates the best of the Tanto and the Hunters tip as well as a deep belly to improve chopping ability. To add function to our new design we have also improved the sheath. The new "B" model sheath is made of ballistic nylon. Has a large survival kit or utility tool pocket and is lined with a tough Kydex sheath to protect the user. The new sheath can be carried either left or right side. Some folks may wonder why we spend so much time talking about knives. The knife, after your knowledge, is the MOST important tool you can have in a survival situation… period. You’ve seen the blades that we think represent the state of the art in metallurgy and in craftsmanship, now we want to show you value. The Anaconda blades are commissioned by Hoods Woods and are made for us by Mike Fuller of Tactical Operations Products (TOPS 208-542-0113 Call him for a catalog and mention us!). Though Mike has a terrific lineup of blades already in high demand, this exclusive knife is made on Ron Hood’s design and features the most desirable traits of a multipurpose survival knife. This project began when we decided to take one of Mike’s blades along with us to the jungles of Peru. We had to be careful with the tools we took since we didn’t want to carry a bunch of excess weight and everything must perform at the highest level possible. Mike’s blade more than "made the cut" and we weren’t disappointed! You can see his blade in operation on our jungle page where we are cleaning a turtle for a meal. Even hacking open heavy shells like these land turtles didn’t phase this blade. When we left the jungle, Chief Basha requested Mikes blade… over all of the other knives we had with us (He’s a headhunter… we gave it to him!). I had already become a believer in Mike’s product. Upon return to the States, Mike and I began to discuss a design that would fit my notions of an ideal wilderness survival blade. After months of trial and error we arrived at what I believe is an exceptional tool at an excellent price. Named the Anaconda, after the flexible killer of the Amazon, we created what I think will be a field Knife that can help you, and your knowledge, survive anything. Delivery Time: Approx. two weeks from time of order. Wire cutting (fence) and bone scoring tool on top of blade. 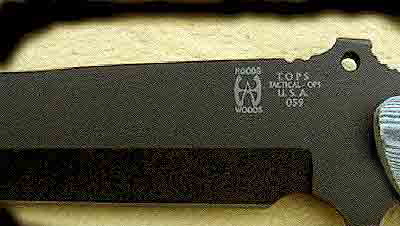 See Tops Knives for availability and current pricing. The following article was published in the April issue of Details magazine. HOOD – "WALKS THE SHARP EDGE"
How is it that a respected outdoor educator is now involved in research and development for the most versatile outdoor tool around? To answer this question we need to take a short look at the background of the man behind the tool. We received the following information from our U.S. Correspondent in Salt Lake City. "I asked the gray bearded man behind the counter at a large knife and gun show if I could pick up the impressive looking knife on the table. "Yes" He said , "that knife you’re now holding was specially designed by Dr. Ron Hood. It is called the Anaconda #7". The knife seemed to mold to my hand like an old leather glove. I held it and admired its unique lines. Several people moved in around me for a closer look, I took several slow downward strikes, (yes I was careful, but I wanted to feel the flow of movement.) It was like being the pilot of a sensitive aircraft, and the knife moved fluidly through its paces. Comfortable at each turn and twist. Beauty, balance and a solid strong look and design. Being a reporter, my investigative instinct took over. (I must admit that while asking questions, I maintained my grip on the anaconda), several of the other onlookers were getting anxious, wanting their turn too. Patience you guys…. Dr. Ron is a 25-year plus veteran of teaching outdoor skills, wilderness survival and leader of various expeditions. He is a jovial cross between Jeremiah Johnson and John Muir, a physically powerful man with sharp eagle eyes. Much of his outdoor experience was gleaned compliments of Uncle Sam. He was a special warfare operator in Viet Nam and the Middle East. Lots of real hard-core field time. In the past few years Ron and his wife Karen (his partner and professional outdoors woman), have been teaching wilderness skills to a wide variety of folks as well as producing a highly successful series of educational videos known as the Woodsmaster Wilderness Skills Series. The videos are recognized as a fine teaching tool, accomplished with lightheartedness and intense attention to detail." "Quite a background" I say to the gray beard, "but how did he develop the Anaconda?" Gray beard says "For the last 5 years Ron has taken a deep interest in developing a great knife for all outdoors people." Ron says "Many of our loyal students and followers depend upon my evaluation and recommendations for tools and equipment, and I want to insure that the responsibility of their trust is well founded. I always recommend the best I can find." I then say to the gray beard, "How did he put it together?" Well about 9 months ago Ron met with a knife manufacturer who made quality tactical tools for professional military and law enforcement. They soon developed a close friendship due to a similarity in special ops background and their joint desire to produce the best possible tools at a realistic cost for their clients (tools with integrity). The new friend was Mike Fuller of TOPS – Tactical Operations Products. Mike worked hand in hand with Ron following Ron’s exacting requirements including a special differential heat treatment, a new pronounced angular style, palm tread grip, Linen Micarta handles, high-impact absorption and a tough finish. After many months of development it is now just weeks from its public debut. The Anaconda #7 (7.5 inch blade, which also can do double duty as a combat/fighter) And the Anaconda #9 (9.5 inch blade). Two bold, fine knives built to last a lifetime and then some. Congratulations Dr. Ron and Mike Fuller on a job well done. P.S. I came to find out the gray beard was Mike Fuller … I enjoyed the exchange. I also bought a couple of his blades.